NASA's Dawn spacecraft, illustrated in this artist's concept, is propelled by ion engines. Zooming deep toward the heart of the asteroid belt, NASA's Dawnspacecraft has accelerated itself into the record books for the biggest singlespeed boost ever by a spacecraft engine. The ion-propelled spacecraft set the new record while on itsway to visit the asteroid belt's twobiggest space rocks, Ceres and Vesta. "We are using this amazing ion-engine technology as astepping-stone to orbit and explore two of the asteroid belt's most mysteriousobjects, Vesta and Ceres," said Robert Mase, Dawn project manager fromNASA's Jet Propulsion Laboratory (JPL), located in Pasadena, Calif. The all-time velocity change record was previously held byNASA's Deep Space 1 probe, which was the first interplanetary spacecraft to useion propulsion technology. Ion propulsion creates thrust by consistently acceleratingions through a nozzle using electrostatic force. Deep Space 1's record fell on June 5, when the Dawnspacecraft's accumulated acceleration over the course of the mission sailedpast the 9,600 mph (15,449 kph) mark. A spacecraft's change in velocity refers to its ability tochange its path through space using its own rocket engines. Measurements ofthis change begin only after the spacecraft exits the last stage of the launchvehicle that initially hurled it into space. NASA launched the Dawn mission onSept. 27, 2007. Since then, Dawnhas had to fire each of its three engines, one at a time, for a cumulativetotal of 620 days in order to reach the asteroid belt and set the new velocitychange record. In doing so, it has used less than 363 pounds (165 kg) of xenonpropellant. Over the course of its eight-plus-yearmission, Dawn's three ion engines are expected to accumulate 2,000 days ofoperation ? equivalent to 5.5 years of thrusting ? for a total change invelocity of over 24,000 mph (38,000 kph). 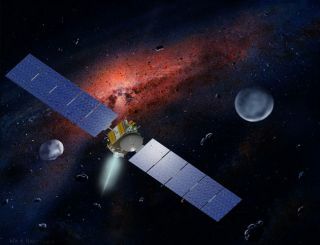 "I am delighted that it will be Dawn that surpassesDS1's record," said Marc Rayman, chief engineer for the Dawn mission, anda previous project manager for Deep Space 1. "It is a tribute to all thoseinvolved in the design and operations of this remarkable spacecraft." While Dawn'senergy thrusts of 0-to-60 mph (0-to-97 kph) in four days may seemunderwhelming, the spacecraft is incredibly efficient. In fact, it expends amere 37 ounces of xenon propellant during that time. Furthermore,after four days of full-throttle thrusting, it continues thrusting for two morefour-day intervals. By the end of 12 days, Dawn will have increased itsvelocity by more than 180 mph (290 kph), with more days, weeks and months ofcontinuous thrusting to come. Over thecourse of a year, Dawn's ion propulsion system can increase the spacecraft'sspeed by a whopping 5,500 mph (8,850 kph), all the while consuming theequivalent of only 16 gallons of fuel. "Thisis a special moment for the spacecraft team," said Dawn's principalinvestigator, Chris Russell of the University of California Los Angeles. "In only 407 days, our minds will be on another set of records, the datarecords that Dawn will transmit when we enter Vesta orbit." The Dawnspacecraft is expected to voyage across 3 billion miles (4.8 billion km) on anodyssey that will include explorations of asteroid Vesta in 2011 and 2012,and the dwarf planet Ceres in 2015. Both Vesta and Ceres have witnessed much ofour solar system's history. By using thesame set of instruments at two separate destinations, scientists can moreaccurately formulate comparisons and contrasts. Dawn's full suite of scienceinstruments will measure shape, surface topography and tectonic history,elemental and mineral composition, as well as seek out water-bearing minerals. Additionally,the way that the spacecraft orbits both Vesta and Ceres will be used to measurethe mass and gravity fields of the celestial bodies. And whileDawn surpassed Deep Space 1's record for velocity change, the older probe stillholds the record for the longest-duration of powered spaceflight, and willcontinue to do so for another few months. Dawn is, however, expected to takeover that record at around early August of this year. Asthe Dawn probe streaks through the asteroid belt headed for a space rockrendezvous, another unmanned probe is returning home from one. Japan's Hayabusaspacecraft is flying ever closer to Earth and set to drop a sample returncapsule that may contain pieces of its asteroid target Itokawa on Sunday, June13. Japan's space agency launched the Hayabusa mission in 2003 and the probearrived at its asteroid target in 2005, but suffered multiple malfunctionsduring its trip. The Dawnmission to Vesta and Ceres is managed by NASA's JPL. The University ofCalifornia, Los Angeles is responsible for overall Dawn mission science.